This custom BMW 3 Series is for sale on Craigslist. Please don't buy it. It has been a while since we shared a crazy car found on Craigslist. That dry spell has been broken by this: a 1989 BMW 3 Series convertible with a widebody kit and scissor doors. Sorry, we meant to say Lamborghini doors. As you might expect the exterior of this E30 wasn’t the only part of the car modified. Under the hood there’s the engine from the E36 M3, a straight-six making 282 horsepower. Also, there are screens in the front head rests because why not go all the way, right? The asking price for this Frankenstein E30 is $19,999. That price is bolstered by the Lambo doors and the body kit, which the seller claims can only be found in Germany. The title is clean and there are 80,000 miles on the clock, although it’s unclear whether those miles are from the new engine or the car itself. Aside from the eye-wrecking doors and body kit this looks to be a perfectly fine E30. The exterior is in great condition and the interior doesn’t look bad for its age, with no signs of cracks in the seat or on the dashboard. This would be an attractive buy at a lower price. Swap the doors, rip off the body kit and you’ve got yourself a punchy little convertible. If you’re interested in purchasing this 3 Series you’ll need to be in Los Angeles. The seller isn’t taking offers without first showing the car. “No offers without seeing the car, it's worth every red cent, you'll obviously never see anything like this again,” the ad declares. The good news is there doesn’t seem to be a mad rush. This ad was posted a month ago to the cars+trucks section of the Los Angeles Craigslist and is still active. 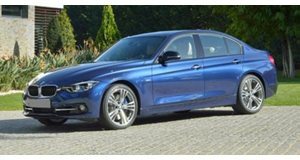 BMW 3 Series still manages to be come out on top in this hotly contested sector.